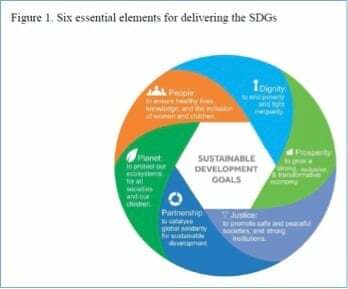 The next phase of the UN’s Millennium Development Goals, fittingly termed the Sustainable Development Goals, shift priorities from insular goals like reducing poverty and increasing hygiene to more inclusive and integrated ones that push for systemic change like the rule of law, dignity and prosperity for all. The implications are significant. And business is being called on to provide active support for the first time. This presents an unprecedented opportunity to tie businesses’ growth to their communities and the environment. For the first time, capitalists are welcome and actively needed at the table. This marks a key acknowledgement that determining our path forward as an interconnected economy will require the tensile strength of every single sector. So how do you make sure your business is syncing its growth plan with the new UN goals? How do you get past the loftiness and map the real changes that are needed against the trajectory of your business plan? You’ll want to start by investing in some scenario planning. You can read the full article on The Guardian. Tell the whole story, help our executives and leaders connect the dots, identify the context, and empower stakeholders through knowledge. When I started writing about these issues, I committed to connecting the dots. Always. A decade later, that hasn’t changed. And remember, joy is contagious. But so is skepticism. Stay clear. Steer carefully – and lead gracefully – onwards. Wishing you a happy and productive 2015. Earlier this year, TriplePundit‘s Nick Aster and I chatted with the Heineken team to discuss what “Brewing a Better Future” meant for the company. 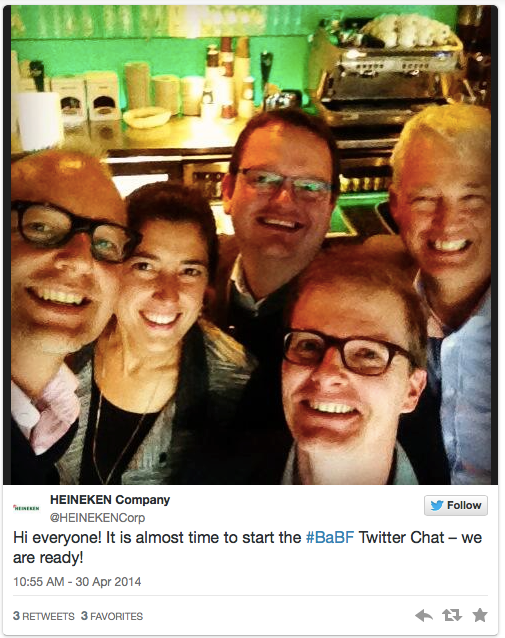 It coincided with the release of its latest CSR Report and the chat, which began with a selfie of the Heineken team, was both engaging and active. It also revealed an area that deserved more digging than we could get to in the allotted hour: the company’s sourcing practices. Got a question? Include it in the comments section below or send it to contact@triplepundit.com. Talk soon! When two adversaries decide to cut across their divides to work together toward a bigger cause, chances are there’s a story – or two – to be told, learned from and examined for replicable tips. Five years ago, Greenpeace launched a nationwide campaign aptly titled #Kleercut to invoke consumer products giant Kimberly-Clark to reexamine its fiber sourcing standards. K-C responded by inviting Greenpeace to a meeting. What emerged from a series of meetings that followed that initial, tense meet up was a collaborative framework that has shifted K-C’s sourcing standards and helped offer both organizations a tangible way to move forward on protecting and conserving forests worldwide. Today, K-C reports a significant increase in its FSC-certified fiber use and notes higher sales across its Kleenex and Scott tissue brands. Marking their “wood” anniversary, K-C’s Sustainability Strategy Leader Peggy Ward along with Greenpeace’s Richard Brooks and Rolf Skar, decided to participate in a live Twitter chat facilitated by TriplePundit’s Nick Aster and me on August 5, 2014. The questions were flying in even before we started keeping the panelists busy through the hour and more: from a behind-the-scenes story about how the two began collaborating five years ago to the future of alternative fibers and how the organizations are working on connecting consumers with sustainability, we covered a lot of ground. For highlights, grab the #Storify version. And to also grab our audience’s perspectives, search for #ForestSolutions on Twitter! On July 24, 2014, I facilitated a live Twitter chat with Barry Parkin, Chief Sustainability Officer at Mars, Inc. and TriplePundit to offer an opportunity to learn more about sustainability at the food manufacturer. As a lead up to the chat, Mars published its fourth annual Principles in Action Summary, which details the company’s approach to business, its progress, and the shared challenges facing both its business and society. As one of the world’s leading food manufacturers with more than 130 manufacturing sites and an expansive supply chain, how does the company contextualize sustainability, set goals that encompass its social and environmental footprint, grow its supply chain and do it all responsibly? For an hour we chatted – with 104 attendees generating almost 600 tweets, over 3.5 million impressions and 27 questions. Here’s the Storify summary. @cmehallow: Does @MarsGlobal use @CDP Water Disclosure to manage/measure its #water impacts? We have just completed our second CDP Carbon response and are evaluating the Water and Forest programs. @csrdispatch: This might be a cheeky question, but do you feel a conflict between commitment to sustainability and selling junk food? Our consumers, both people and their pets, get nutrition and pleasure from our products. We are continuing to look at the role of our portfolio in addressing nutrition and obesity. @kellyfmill: Specific ways #sustainability goals are integreated w/ other departments? We believe it’s everybody’s responsibility, therefore we have goals in all functions/departments in the business. Yes, as an example in cocoa, we are providing training, latest planting material and access to fertilizer for farmers. @wssocialimpact: How does @MarsGlobal address sustainability goals in the short term? @gurumug: How do you cross-verify #sustainability reporting standards/systems ? We have a third party audit of our data and an assurance by Corporate Citizenship. @greenguyboston: Glad to see your sustainable sourcing goals, but what is your progress to date against them? Check out our 2013 Principles in Action Summary to learn more on our progress to date: http://mars.com/pia. @jreneemorin: What are @MarsGlobal biggest challenges working with suppliers on #MarsSusty? One of the challenges is that we work with 100k+ suppliers and often many tiers of them back to the farmer. @cmehallow: When @MarsGlobal needs to access capital markets, does its strong #susty program provide advantage? @rohitms4: Is there any specific standard to measure your success in #sustainability? Yes, measurement of impact and not just activity. In 2013 we did more than 500K hours of Associate training, and through the Mars Volunteer Program, 19K Associates devoted 70K hours to their communities. Because there are more farmers in cocoa than any other crop we purchase, we started there first and we’re looking to learn from our experiences in cocoa. There are Associates at every factory around the world and collaborating across our sites to achieving our SiG goals. Want to chat with us? Email me for more details. With the launch of its first professional body, has sustainability lost its edge? >> Interesting albeit controversial take by Guardian Sustainable Business’ Jo Confino. Does the sustainability sector need one more professional accreditation? Conducted by the Center for Sustainability & Excellence [CSE] group and certified by the Institute of Environmental Management & Assessment [IEMA], the workshop had all the telltale signs of a robust professional certificate curriculum. From comparing the leaders vs. the laggards in “CSR practices,” the emerging trends in CSR reporting and the regional differences in how corporations were interpreting “corporate social responsibility,” to writing a CSR plan for my company that encompassed sustainability factors as well as social and economic goals, the curriculum was rigorous and gave me a lot of information to process and use for years to come. It also gave me a moniker – CSR-P – that I have used over the years to indicate that I am a CSR Professional. Did it invite curiosity? Often. Did it help explain my credentials and experience more credibly? Sometimes. More importantly, the workshop made me think. It made me dive into research. It taught me materiality and helped me sift between greenwashing, whitewashing and the many other labels of our sector. And it also opened up a path for me that otherwise would have remained superfluous and intangible in definition. But back to Jo’s article: Do we need one more professional accreditation? But as the sector grows, divides, integrates and subsumes within organizations, we do need groups/associations to allow sustainability professionals to learn from each other’s challenges, share best practices and grow the cadre of professionals integrating CSR and sustainability into their skill sets and mindsets. And if this critical mass of influencers and practitioners can then influence other professionals – HR, Accounting, Technology, Finance, etc. – to shift their thinking and modus operandi to align with our mutual goal of preparing ourselves to coexist in a shared / new / circular / no waste [pick your preference] economy, that would be a win. Not only for the Institute of Corporate Responsibility and Sustainability but for our entire sector. Thoughts? Leave a comment or connect with me @AmanSinghCSR. The company’s work with the Rainforest Alliance is well-known – by setting targets like sourcing 100 percent of its palm oil sustainably, Unilever has made it easier for other companies to follow suit and helped complex supply chains become comfortable with change and collaboration. And, the company hasn’t stopped at palm oil. Today, roughly 50 percent of the company’s tea originates on Rainforest Alliance Certified farms as it works toward sourcing 100 percent of its raw agricultural materials from sustainable origins (that figure currently stands at 48 percent). “When we launched it we said we don’t have all the answers. One of the reasons why we are working so well with Rainforest Alliance is because we share common goals. Take tea for example: Standards are driving up fast in an industry that’s not easy to standardize. [This is where the] scale of Rainforest Alliance is significant – and essential for the USLP to come alive. “In the absence of politicians, we need to move faster. Climate change is a great opportunity for business. Report from the White House is an encouraging sign. Needle is starting to move in the U.S. The tornadoes and hurricanes are starting to drive the message home for people. “I always say, don’t blame the consumers. There are many examples where consumers are leading business, especially the young ones. They’re changing our lives and systems. “I spend a lot of time on how to develop leaders who can lead us through partnerships, with purpose, can think long-term and beyond 2020. On my way back from Abu Dhabi last month, I was reading an article that reported university students rebelling against the way economics [is being taught]. If teachers are teaching Milton Freidman’s theories, who is going to change the economy? For my kids, sustainability is the new normal. They don’t want to watch TV or buy the newest gas-guzzling car. Their generation is already thinking differently. Yet, marketers keep saying consumers don’t want it. “Marketers should switch from asking whether consumers are willing to pay for something to which consumer doesn’t want less poverty, more education, a healthier world with cleaner air and better nutrition. “We must get out of short termism because lots of solutions are long-term [climate change, access to education, water shortage, etc.] – and we can only solve them if we invest over longer periods and evaluate the social and economic capital. Then business people can optimize these. For example, 40 of the top 100 companies are already pricing carbon internally. They’ve committed to stay within these limits. Business is leading because they see the cost of action vs. inaction. We have now 40 countries that are pricing carbon including China. We have 20 other countries that are putting a tax on carbon. The system is starting to move. “We need to give politicians confidence that this [focus on sustainable development and long termism] will not kill jobs or stifle growth. The exact opposite is in fact true but we need to provide the proof points. Originally written for and published on CSRwire’s Commentary section Talkback on June 2, 2014. For Cristina Amorim, sustainability has been an evolutionary journey. Having spent almost a decade with Life Technologies – a life sciences company that produces a wide range of medical and research science products – which quadrupled in size through a series of mergers and acquisitions in that time, the company’s chief sustainability officer has seen multiple renditions of sustainability evolving to the next level. “I’ve spent a decade looking at opportunities and getting sustainability initiatives off the ground that engage every employee, from the copy room to the board room,” she says. On the heels of the announcement that Thermo Fisher Scientific, a giant in life sciences research, is acquiring Life Technologies, I caught up with Amorim on what the past decade has taught her – and her employer – about setting a sustainability strategy that is evolutionary—moving from being good to being smart business. From 2008 to 2012, the company cut energy use by 22 percent, water use by 52 percent, hazardous waste by 13 percent and CO2 emissions by 21 percent, according to its latest sustainability report. With greater growth on the horizon, can Life Technologies continue its sustainability march? According to Amorim, that’s the wrong question. So how did Amorim, who was recognized by Ethical Corporation in 2012 as Sustainability Executive of the Year and is Life Technologies’ first CSO, initiate a sustainability strategy that leverages the company’s technology in the markets it serves? In a world where 70 percent of available freshwater is used for agricultural irrigation, Life Technologies products have the potential to transform food economics. By re-engineering seeds, scientists can create higher-yield and drought-resistant crops. As a biotechnology company, Life Technologies manufactures temperature-sensitive products requiring storage and shipment conditions ranging from -80° Celsius to ambient. Cold shipping requires expanded polystyrene (EPS) coolers and refrigerants like dry ice and gel packs, to maintain specific conditions during transport. As the U.S.’ largest shipper of dry ice with FedEx, each year we ship 800,000 EPS coolers (equivalent to 105 truckloads) and consume 4500 metric tons of dry ice, costing $15 million in packing, refrigerant and freight. Given the poor recyclability of EPS, energy intensity of refrigerants and package weight, this represents our largest environmental impact and opportunity. Through a robust stability testing program, we have proven that some of our products can safely withstand ambient transport conditions. Just like transporting ice cream from the supermarket to your home freezer– we don’t carry a cooler or dry ice in our trunk. “So far we’ve converted genetic analysis, sequencing, cell culture and molecular biology reagents, top-selling capillary electrophoresis and transfection reagents. The impact has been significant—each year, we now ship 250,000 fewer EPS coolers (33 fewer truckloads), use 2400 fewer metric tons of refrigerant, and save $4 million in operational costs globally. Most importantly, we know our packaging becomes our customers’ waste. These product conversions help us leave less branded garbage in their hallways. Of course, the effort requires engagement across multiple functions. “From R&D to distribution and sales & marketing, everyone has a part to play. We tapped into natural leaders across these functions to become ambassadors for these initiatives. It provided them with visibility and career growth opportunities. They are delivering cost savings, protecting the environment and feeling good about it,” she added. While these examples prove a significant point about how sustainability thinking can shift mindsets on profit, purpose and business value across organizations, what about Life Technologies’ external supply chain? With over 50,000 products and complex transportation cycles, how is the company addressing sustainability in its supply chain? We approached the glove supplier, Kimberly-Clark, who partnered with us to implement a glove take-back program. It started in one location and has today expanded to five. We segregate the gloves at the point of use and Kimberly-Clark sends them to TerraCycle, who turn them into purple park benches. This partnership provides true value—glove take-back helped us achieve our zero waste goal and helped Kimberly-Clark increase their revenue by becoming our sole glove supplier globally. The circular economy has arrived. That is what excites Amorim, one of very few female CSOs in the private sector. “The regulatory environment is also helping us close the loop. The WEEE [Waste Electric Electronic Equipment] legislation in Europe is one example,” says Amorim. For Life Technologies and other companies, refurbished instruments open up an entire new market. At a lower price point, instruments such as DNA sequencers are more accessible to more scientists. And with increased revenue, the WEEE obligation becomes an opportunity. While issues like cold chain shipment, waste, and regulatory compliance present thorns on the way to the gilded goal of a closed-loop model for Life Technologies, triangular connections in its supply chain and their appetite for cutting-edge innovation leads one to believe the opportunities are endless for Amorim and her team. Originally written for and published on CSRwire’s Commentary section Talkback on July 22, 2013.